Star Wars: Knights of the Old Republic (sometimes known simply as Knights of the Old Republic or KOTOR) is a role-playing video game set in the Star Wars universe. Developed by BioWare and published by LucasArts, the game was released for the Xbox on July 15, 2003, and for Microsoft Windows on November 19, 2003. The game was later ported to Mac OS X, iOS, and Android by Aspyr, and it is playable on the Xbox 360 and Xbox One via their respective backwards-compatibility features. The story of Knights of the Old Republic takes place almost 4000 years before the formation of the Galactic Empire, where Darth Malak, a Dark Lord of the Sith, has unleashed a Sith armada against the Republic. The player character, as a Jedi, must venture to different planets in the galaxy in order to defeat Malak. Players choose from three character classes and customize their characters at the beginning of the game, and engage in round-based combat against enemies. Through interacting with other characters and making plot decisions, the alignment system will determine whether the player's character aligns with the light or dark side of the Force. The game was directed by Casey Hudson, designed by James Ohlen, and written by Drew Karpyshyn. LucasArts proposed developing a game tied to Star Wars: Episode II – Attack of the Clones, or a game set thousands of years before the prequels. The team chose the latter as they thought that they would have more creative freedom. Ed Asner, Ethan Phillips, and Jennifer Hale were hired to perform voices for the game's characters, while the soundtrack was composed by Jeremy Soule. Announced in 2000, the game was delayed several times before its release in July 2003. The game received critical acclaim upon release, with critics applauding the game's characters, story, and sound. It was nominated for numerous awards, and is considered one of the best games ever made. A sequel, Star Wars: Knights of the Old Republic II – The Sith Lords, developed by Obsidian Entertainment at BioWare's suggestion, was released in 2004. The series' story continued with the 2011 release of Star Wars: The Old Republic, a MMORPG developed by BioWare. Players choose from three basic character classes at the beginning of the game, and later choose from three Jedi subclasses. Beyond class, a character has "skills" stats, tiered "feats", and later on, tiered Force powers, similar to magic spells in fantasy games. Feats and Force powers are generally unlocked upon level-up, while the player is given skill points to distribute among their skills every level. Combat is round-based; time is divided into discrete rounds, and combatants attack and react simultaneously, although these actions are presented sequentially on-screen. The number of actions a combatant may perform each round is limited. While each round's duration is a fixed short interval of real time, the player can configure the combat system to pause at specific events or at the end of each round, or set the combat system to never automatically pause, giving the illusion of real-time combat. Combat actions are calculated using DnD rules, particularly d20 System. While these are not displayed directly on the screen, the full breakdown for each action (including die rolls and modifiers) is accessible from a menu. For much of the game, the player can have up to two companions in their party. These companions will participate in combat. They can be manually controlled by the player, or act autonomously if the player does not give them any input. Outside of combat, the companions will randomly engage the player or each other in dialogue, sometimes unlocking additional quests. They will also participate in conversations the player has with other non-player characters. Non-combat interaction with other characters in the game world is based upon a dialogue menu system. Following each statement, the player can select from a list of menu responses. The dialogue varies based on the gender and skills of the main character. The alignment system tracks actions and speech—from simple word choices to major plot decisions—to determine whether the player's character aligns with the light or dark side of the Force. Generosity and altruism lead to the light side, while selfish or violent actions will lead the player's character to the dark side, which will alter the character's appearance, turning their eyes yellow and their skin pale. In addition to the standard role-playing gameplay, there are several minigame events that come up over the course of the game. The player can participate in swoop racing to earn money, and sometimes interplanetary travel will be interrupted by enemy starfighters, which begins a minigame where the player controls a turret to shoot down the opposing starcraft. The player can also engage in a card game known as pazaak, which is similar to the game of blackjack, to gamble money. The story takes place approximately 4,000 years before the rise of the Galactic Empire. Darth Malak, a former Jedi, Dark Lord of the Sith and Darth Revan's former apprentice, has unleashed a Sith armada against the Republic. Malak's aggression has left the Jedi scattered and vulnerable; many Jedi Knights have fallen in battle and others have sworn allegiance to Malak. The game opens with the player's character—the player can choose a face and be male or female (canonically a male)—awakening aboard a Republic ship, the Endar Spire, which is under attack by Malak's forces over the city world of Taris. Republic soldier Trask Ulgo soon arrives and informs the player character that they are under attack. Fighting their way to the escape pods, Trask and the player character are soon confronted by Sith Lord Darth Bandon. With no other options, Trask sacrifices himself while the player continues to make their way to the escape pods. The player character soon meets up with Carth Onasi, a skilled pilot and Republic war hero, and they escape the doomed warship. Crashing on the surface of Taris, the player character is knocked unconscious and Carth pulls them away from the wreckage. After suffering a strange vision, the player character awakens in an abandoned apartment with Carth, who explains that Taris is currently under martial law by Malak's forces who are currently searching for the Jedi Knight Bastila Shan, known for her mastery of battle meditation, a Force technique which strengthens one's allies and weakens one's enemies during battle. Carth and the player character go in search of her and manage to meet new companions along the way, such as the Twi'lek street urchin Mission Vao and her Wookiee companion Zaalbar. The group eventually finds and rescues Bastila from the Black Vulkar gang. With the help of utility droid T3-M4 and Mandalorian mercenary Canderous Ordo, the group escapes Taris aboard the Ebon Hawk, moments before the planet surface is decimated by Malak's fleet in a vain effort to kill Bastila. While taking refuge at the Jedi Academy on Dantooine, the player's character trains to be a Jedi, discovers a "Star Map", and learns of the "Star Forge", the probable source of Malak's military resources. The player's character and their companions search planets across the galaxy—Dantooine, Manaan, Tatooine, Kashyyyk, and Korriban—for more information about the Star Forge, gaining new companions along the way such as the Cathar Jedi Juhani, assassin droid HK-47, and 'Grey' Jedi Jolee Bindo. Through the course of their travels, the player will eventually discover their character's true identity—the brainwashed Darth Revan, whom the Jedi Council on Dantooine took in and subjected to memory modification so that he would no longer be a threat to the galaxy, the various visions they had been experiencing being Revan's memories. Darth Revan had been injured when attacking a Republic planet because Darth Malak turned his ship's guns on his former master, intent on usurping him. Because Bastila was aboard Revan's ship with a Jedi strike force, she was able to heal him and bring him to the Jedi Council on Dantooine. Her actions lead to the force bond between her and Revan, which plays a role later in the game. Depending on the character's alignment, upon ultimately reaching the Star Forge they either defeat the Sith (the light-side path) or usurp control from Malak (the dark-side path). A light-aligned character is hailed as a savior and hero; a dark-side character stands before the remaining Sith forces as the new Dark Lord of the Sith. Eventually joining the main character's quest are veteran Republic pilot Carth Onasi, the Twi'lek teenager Mission Vao and her Wookiee companion Zaalbar, the Jedi Bastila Shan, 'Grey' Jedi Jolee Bindo, utility droid T3-M4, Mandalorian mercenary Canderous Ordo, and assassin droid HK-47 if he is bought. Juhani, another Jedi, may also join the party if she is not killed fighting the main character. Several of these characters, including Canderous Ordo, HK-47 and T3-M4, also appear in the sequel, Star Wars: Knights of the Old Republic II – The Sith Lords. Republic soldier Trask Ulgo is also playable briefly on the Endar Spire. Antagonists include Black Vulkar gang leader Brejik, crime boss Davik Kang, bounty hunter Calo Nord, Zaalbar's twisted brother Chuundar, Malak's Sith apprentice Darth Bandon, Sith Admiral Saul Karath, Sith Overseer Uthar Wynn, Rakatan tribe leader The One, and Darth Malak, the Dark Lord of the Sith. On several planets the main character deals with Czerka Corporation, a company operating on several planets that allied itself with the Sith, engaged in slave trade and other nefarious practices. Major allies that help the player's party along the way are Hidden Bek gang leader Gadon Thek, Jedi Masters Vandar Tokare and Zhar Lestin, game hunter Komad Fortuna, Zaalbar and Chuundar's father Freyyr, Uthar's Sith apprentice Yuthura Ban, Republic representative Roland Wann, the Rakatan tribe "The Elders", and Republic Admiral Forn Dodonna. Action takes place on the planets Tatooine, Dantooine, Kashyyyk, Korriban, Manaan, Rakata Prime, and Taris; aboard the Republic cruiser Endar Spire and Saul Karath's ship Leviathan; and on the Star Forge space station. A space station near Yavin is a playable location in the PC, Mac OS X, and mobile versions of the game and is available to Xbox players via download from Xbox Live. Travel between these locations happens aboard the freighter Ebon Hawk, which is also a playable location. In July 2000, BioWare announced that they were working with LucasArts to create a Star Wars role-playing video game for the PC and next-generation consoles. Joint BioWare CEO Greg Zeschuk commented that "The opportunity to create a richly detailed new chapter in the Star Wars universe is incredibly exciting for us. We are honored to be working with the extremely talented folks at Lucas Arts, developing a role-playing game based upon one of the most high-profile licenses in the world." The game was officially unveiled as Star Wars: Knights of the Old Republic at E3 2001. At this point, the game had been in development for around six months. "Preproduction started in 2000, but the discussions started back in 1999," LucasArts' Mike Gallo said, "The first actual e-mails were in October or November of '99. That's when we first started talking to BioWare. But some really serious work finally started at the beginning of 2000." The decision to set the game four thousand years before Star Wars: Episode I – The Phantom Menace was one of the first details about the game made known. LucasArts gave BioWare a choice of settings for the game. "LucasArts came to us and said that we could do an Episode II game," BioWare CEO Raymond Muzyka said. "Or LucasArts said we could go 4,000 years back, which is a period that's hardly been covered before." BioWare chose to set the game four thousand years before the films as it gave them greater creative freedom. They aimed to create content similar to that from the films but different enough to be a definite precursor. Concept work had to be sent to "the ranch" to be approved for use. Muzyka noted that very little of their content was rejected: "It was more like, 'Can you just make his head like this rather than like that.' So it was all very feasible. There were good suggestions made and they made the game better, so we were happy to do them. It was a good process really and I think we were pleasantly surprised how easy LucasArts was to work with." Zeschuk said that "Overall, we were really happy with the results. We felt like we had enough freedom to truly create something wonderful." Gallo said that BioWare and LucasArts were aiming for a gameplay time of around sixty hours: "Baldur's Gate was 100 hours of gameplay or more. Baldur's Gate 2 was 200 hours, and the critical-path play through Baldur's Gate 2 was 75 hours... We're talking smaller than that [for Knights of the Old Republic], dramatically, but even if it's 60 percent smaller, then it's still 100 hours. So our goal for gameplay time is 60 hours. We have so many areas that we're building--worlds, spaceships, things like that to explore--so we have a ton of gameplay." Project director Casey Hudson said that one of the greatest achievements and one of the greatest risks was the combat system. "We wanted to create something that combined the strategic aspects of our Baldur's Gate series and Neverwinter Nights but which presented it through fast, cinematic 3D action," Hudson said. "That required us to make something that hadn't really been done before." Creating system was a daunting task, because of the many factors to cover, which were difficult to visualize. The developers intended to make the game have more open-ended gameplay. Gallo compared some situations to Deus Ex: "You have several ways to get through an area and you might need a character who has a specific skill to do that." LucasArts and BioWare settled on developing Knights of the Old Republic for the PC and Xbox. The Xbox was chosen over other consoles because of BioWare's background of developing PC games and greater familiarity with the Xbox than other consoles: "We could do the things we wanted to do on the Xbox without as much effort as we'd need to do it on the PS2 or GameCube," Gallo said. Other factors included the console's recent success and the opportunity to release one of the Xbox's first RPGs. BioWare had previously developed MDK2 for the Dreamcast and PlayStation 2. Hudson said that "Having experience in developing for other consoles gave us the proper mindset for implementing this game on the Xbox, and, by comparison, the Xbox was relatively easy to develop for." Hudson did, however, note that there were some challenges during development. One of the difficulties was in deciding how much graphical detail to provide. "Since our games generally have a lot of AI and scripting, numerous character models, and huge environments, we stress the hardware in a very different way than most games," Hudson said. This made it difficult to predict how well the game would run. The game uses the Odyssey Engine, based on the Aurora Engine (previously developed by BioWare for use in Neverwinter Nights) but completely rewritten for Knights of the Old Republic. It was highly detailed for its time: grass waves in the wind, dust blows across Tatooine and puffs of sand rise as the player walks across the seabed. The choreography for the character animations was done using 3DS Max. Hudson noted that the differences between consoles and PCs mean that the graphics would have to be modified. "You typically play console games on a TV across the room while PC games are played on a monitor only inches away." Console games put effort into close-up action and overall render quality; PC games emphasize what can be done with high resolutions and super-sharp textures. Hudson also noted that the difference between a game controller and mouse-and-keyboard setup influenced some design decisions. The PC version features an extra location the player can visit and more NPCs, items and weapons; these additions were later made available on the Xbox version through Xbox Live. The PC version supports higher display resolutions (up to 1600x1200) and has higher-resolution textures. While the main game, graphics engine and story were developed by BioWare, LucasArts worked on the game's audio. Knights of the Old Republic contains three hundred different characters and fifteen thousand lines of speech. "One complete copy of the Knights of the Old Republic script fills up 10 5-inch binders," voice department manager Darragh O'Farrell noted. A cast of around a hundred voice actors, including Ed Asner, Raphael Sbarge, Ethan Phillips, Jennifer Hale, and Phil LaMarr was assembled. "Fortunately, with a game this size, it's easy to have an actor play a few different characters and scatter those parts throughout the game so you'll never notice it's the same actor you heard earlier," O'Farrell said. Voice production started six months before the game's beta release. The voice production team were given the script 90% complete to work with. "There were a few changes made during recording, but most of the remaining 10 percent will be dealt with in our pickup session," O'Farrell said, "The pickup session is right at the end of the project, where we catch performance issues, tutorial lines, verbal hints, and anything else that we might have overlooked." A game the size of Knights of the Old Republic would typically take seven weeks to record; two weeks of recording all-day and all-night meant LucasArts were able to record all voices in five weeks. Actors were recorded one at a time, as the non-linear nature of the game meant it was too complicated and expensive to record more than one actor at a time. Most of the dialogue recorded was spoken in Galactic Basic (represented by English); however, around a tenth of the script was written in Huttese. Mike Gallo used Ben Burtt's Star Wars: Galactic Phrase Book & Travel Guide to translate English into Huttese. "The key to recording alien dialogue is casting the right actor for the part," O'Farrell said, "Over the years I've had actors take to Huttese like a fish to water, but the opposite is also true. In the past I've had to line-read (when an actor copies my performance) 150-plus Huttese lines to an actor in order to make it work." Award-winning composer Jeremy Soule was signed to compose the game's score. "It will be a Star Wars score, but it will all be original, and probably the things that will remain will be the Force themes and things like that," Gallo said. Soule was unable to write a full orchestral score for Knights of the Old Republic due to technical limitations: "At the time we only had an 8 megabit per second MIDI system. That was state of the art... I had to fool people into thinking they were hearing a full orchestra. I’d write woodwinds and drums, or woodwinds, horns and drums, or strings and drums and brass. I couldn’t run the whole orchestra at once, it was impossible." When announced at E3 2001, Knights of the Old Republic was originally scheduled for a late 2002 release. In August 2002 it was announced on the game's forums that its release had been delayed: the Xbox version was to be released in spring 2003 and the PC version in summer 2003. A further delay was announced in January 2003, with both versions of the game expected to be released in fall 2003. Zeschuk attributed the delay to BioWare's focus on quality: "Our goal is to always deliver a top-notch gameplay experience, and sometimes it can be very difficult to excel in all areas. We keep working on tackling each individual issue until we feel we've accomplished something special." 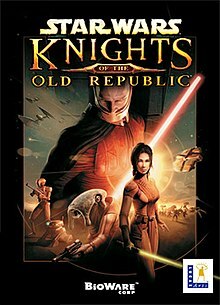 The Xbox version of Knights of the Old Republic went gold on July 9, 2003 with a release date of July 15. It sold 250,000 copies in the first four days of its release, making Knights of the Old Republic the fastest-selling Xbox title at the time of its release. Following the game's release, it was announced that free downloadable content would be available through Xbox Live at the end of the year. The PC version of the game went gold on November 11, 2003 and was released on November 18. It was re-released as part of the Star Wars: The Best of PC collection in 2006. The game was released on Steam on May 14, 2012 for Mac OS X. The game was released for the iPad on May 30, 2013. The iPad version includes the Yavin Station DLC that was previously released for Xbox and PC. The game was released as DRM-free download on GoG.com in October 2014. The game was also launched on Android's Google Play Store on December 22, 2014. In October 2017, Microsoft made the Xbox One console backward compatible with the Xbox version of the game, as part of a 13-game curated catalog. After its release on July 15, 2003, the first Xbox shipment of Knights of the Old Republic sold out within four days on shelves, which amounted to 250,000 sales during that period. This made it the console's fastest-ever seller at the time of its launch. The game ultimately sold 270,000 copies in its initial two weeks, and was ranked by The NPD Group as the #2 best-selling console game of its debut month across all platforms. It fell to the 8th position on NPD's sales chart for August and was absent by September. Worldwide sales reached 600,000 copies by October. In the United States alone, the Xbox version of Knights of the Old Republic sold 1.3 million copies and earned $44 million by July 2006. It also received a "Silver" sales award from the Entertainment and Leisure Software Publishers Association, indicating sales of at least 100,000 copies in the United Kingdom. Following its launch in November 2003, the computer version of Knights became the third-best-selling computer title of its debut week, according to NPD. Although it dropped out of NPD's weekly top 10 by its third week, it claimed sixth place in computer game sales for November overall, and ninth for December. It returned to the weekly top 10 during the December 28-January 3 period, but was absent again on the next week's chart. NPD ultimately declared it the 17th-best-selling computer game of 2004. By August 2006, the computer version had sold 470,000 copies and earned $14.7 million in the United States alone. Edge ranked it as the country's 32nd-best-selling computer game released between January 2000 and August 2006. Total sales of the game's Xbox and computer releases surpassed 2 million copies by February 2005 and 2.5 million by May, and reached nearly 3 million by March 2006. As of 2007, Knights of the Old Republic had sold 3.2 million units. Star Wars: Knights of the Old Republic received "universal acclaim" according to review aggregator Metacritic, and won numerous awards, including Game Developers Choice Awards' 2004 game of the year, BAFTA Games Awards' best Xbox game of the year, and Interactive Achievement Awards for best console RPG and best computer RPG. Knights of the Old Republic has seen success as the game of the year from many sources including IGN, Computer Gaming World, PC Gamer, GMR, The Game Developers Choice Awards, Xbox Magazine, and G4. Computer Games Magazine named it the best computer game of 2003, and presented it with awards for "Best Original Music" and "Best Writing". The editors wrote, "The elegance and accessibility that BioWare made part-and-parcel of this game should be the future standard for this genre." According to the review aggregator Metacritic, the PC version received an average score of 93 based on 33 reviews. In total, the game has won over 40 game of the year awards from various publications. Interactive Achievement Awards awarded it for Best Story and Best Character Development. IGN gave KotOR additional awards in Best Sound (Xbox category), Best Story (PC category), Xbox RPG of the Year 2003, PC RPG of the Year 2003, Xbox Game of the Year 2003, PC Game of the Year 2003, and Overall Game of the Year 2003 across all platforms. In 2007, IGN listed it at #27 on its list of the Top 100 Games of All-Time. In 2010, IGN placed the game at #3 on its Best games of the Decade (2000–2009), beaten by Shadow of the Colossus and Half-Life 2. At the 2004 Game Developers Choice Awards, HK-47 won the category of "Original Game Character of the Year". In 2007, the plot twist in KotOR was ranked number two in Game Informer's list of the top ten video game plot twists of all time and number 10 on ScrewAttack's "Top 10 OMGWTF Moments". The game is also part of The Xbox Platinum Series/Classics for sales in excess of 1 million units. The Los Angeles Times listed Knights of the Old Republic as one of the most influential works of the Star Wars Expanded Universe. In 2010, Game Informer named the game the 54th best game on their Top 200 Games of All Time list. In November 2012, Time named it one of the 100 greatest video games of all time. In 2019, Kathleen Kennedy stated that Lucasfilm was looking into developing movies or television series in the Knights of the Old Republic era, but that no plans had yet been made. ^ Yin-Poole, Wesley (December 23, 2014). "Star Wars: Knights of the Old Republic launches on Android". Eurogamer. Gamer Network. Retrieved December 25, 2014. ^ "Classic Postmortem: BioWare's Star Wars: Knights of the Old Republic". Gamasutra. July 14, 2017. ^ Wallace, Daniel (October 25, 2005). The New Essential Chronology to Star Wars. Del Rey. ISBN 978-0-345-44901-6. ^ a b IGN staff. "Star Wars RPG Announced". IGN. Archived from the original on October 18, 2007. Retrieved July 5, 2009. ^ IGN staff. "First-Ever Star Wars RPG". IGN. Retrieved July 5, 2009. ^ a b Ajami, Amer. "E3 2001: LucasArts unveils BioWare RPG". GameSpot. Retrieved July 5, 2009. ^ a b c d e f g h GameSpot staff. "Star Wars Knights of the Old Republic Q&A (Mar 6, 2002)". GameSpot. Retrieved July 6, 2009. ^ Bishop, Stuart. "Interview: Knights fever". ComputerAndVideoGames.com. Retrieved July 9, 2009. ^ a b c d Bishop, Stuart. "Interview: Bump in the Old Republic Knights". ComputerAndVideoGames.com. Retrieved July 6, 2009. ^ a b c d e f g h i GameSpot staff. "Star Wars: Knights of the Old Republic Q&A (Oct 28, 2003)". GameSpot. Retrieved July 6, 2009. ^ a b "Combat System Development on KOTOR". Game Developer Magazine. December 2003. pp. 42–56. ^ Bishop, Stuart. "Interview: Bioware's PC Knights exposed!". ComputerAndVideoGames.com. Retrieved August 26, 2009. ^ a b c d e "Star Wars: Knights of the Old Republic Q&A (Apr 23, 2003)". GameSpot. Retrieved July 7, 2009. ^ a b "Interview with composer Jeremy Soule at PLAY! San Jose". Music 4 Games. Retrieved July 7, 2009. ^ Parker, Sam. "Knights of the Old Republic delayed". GameSpot. Retrieved August 26, 2009. ^ Sulic, Ivan. "The Republic Gets Older". IGN. Retrieved August 26, 2009. ^ Parker, Sam. "Knights of the Old Republic goes gold". GameSpot. Retrieved August 26, 2009. ^ "KOTOR breaks sales record on Xbox". ComputerAndVideoGames.com. Retrieved August 26, 2009. ^ "KOTOR Xbox live downloads - new details". ComputerAndVideoGames.com. Retrieved August 26, 2009. ^ Thorsen, Tor. "PC Knights of the Old Republic golden". GameSpot. Retrieved August 26, 2009. ^ Sinclair, Brendan. "Star Wars gets bundled". GameSpot. Retrieved June 20, 2007. ^ "STAR WARS™: Knights of the Old Republic on". Gog.com. Retrieved October 25, 2016. ^ a b c "BioWare Delivers Hit Titles on PC and Console" (Press release). Edmonton: BioWare. August 25, 2003. Archived from the original on August 30, 2003. ^ a b "LucasArts Star Wars: Knights of the Old Republic Posts Record Sales in First Two Weeks of Release" (Press release). San Rafael, California: LucasArts. August 1, 2003. Archived from the original on April 19, 2004. ^ a b Bach, Robert J. (July 24, 2003). "2003 Financial Analyst Meeting". Microsoft. Archived from the original on October 11, 2003. ^ Varanini, Giancarlo (July 25, 2003). "KOTOR sets Xbox sales records". GameSpot. Archived from the original on April 14, 2004. ^ "July 2003 Video Game Best-Selling Titles and Console Accessories". The NPD Group. Archived from the original on March 10, 2004. ^ "August 2003 Video Game Best-Selling Titles and Console Accessories". The NPD Group. Archived from the original on December 26, 2003. ^ "September 2003 Video Game Best-Selling Titles and Console Accessories". The NPD Group. Archived from the original on February 21, 2004. ^ IGN Xbox (October 10, 2003). "KOTOR 2 | Rebel X". IGN. Archived from the original on June 14, 2004. ^ Thorsen, Tor (December 3, 2003). "Weekly NPD PC game sales chart: November 16–22". GameSpot. Archived from the original on August 5, 2004. ^ Thorsen, Tor (December 9, 2003). "Weekly NPD PC game sales chart: November 23–30". GameSpot. Archived from the original on August 5, 2004. ^ Thorsen, Tor (December 16, 2003). "Weekly NPD PC game sales chart: November 30-December 6". GameSpot. Archived from the original on August 5, 2004. ^ "Top-Selling Software: December 2003". The NPD Group. Archived from the original on February 14, 2004. ^ Thorsen, Tor (January 14, 2004). "NPD PC game sales: December 21–27 and December 28-January 3". GameSpot. Archived from the original on August 5, 2004. ^ Thorsen, Tor (January 22, 2004). "Weekly NPD PC game sales chart: January 4–10". GameSpot. Archived from the original on June 4, 2004. ^ Essential Facts about the Computer and Video Game Industry; 2005 Sales, Demographics and Usage Data (PDF) (Report). Entertainment Software Association. May 18, 2005. p. 5. Archived from the original (PDF) on November 4, 2005. ^ "About BioWare". BioWare. Archived from the original on February 5, 2005. ^ "About BioWare". BioWare. Archived from the original on May 17, 2005. ^ "About BioWare". BioWare. Archived from the original on March 23, 2006. ^ "Star Wars: Knights of the Old Republic for Xbox". GameRankings. CBS Interactive. Retrieved June 10, 2018. ^ "Star Wars: Knights of the Old Republic for PC". GameRankings. CBS Interactive. Retrieved June 10, 2018. ^ "Star Wars: Knights of the Old Republic for Xbox Reviews". Metacritic. CBS Interactive. Retrieved October 25, 2016. ^ a b "Star Wars: Knights of the Old Republic for PC Reviews". Metacritic. CBS Interactive. Retrieved October 25, 2016. ^ "Star Wars: Knights of the Old Republic for iPhone/iPad Reviews". Metacritic. CBS Interactive. Retrieved June 10, 2018. ^ Gillen, Kieron. "EuroG KOTOR Review". EuroGamer. Retrieved April 10, 2009. ^ Kasavin, Greg. "Gamespot KOTOR review". Gamespot. Retrieved December 14, 2010. ^ Stapleton, Dan. "GRadar KOTOR review". GamesRadar. Retrieved April 10, 2009. ^ Boulding, Aaron. "IGN KOTOR review". IGN. Retrieved April 10, 2009. ^ Reiner, Andrew. "GI KOTOR review". GameInformer. Archived from the original on December 23, 2005. Retrieved April 10, 2009. ^ Padilla, Raymond. "GameSpy KOTOR review". GameSpy. Retrieved April 10, 2009. ^ "CVG KOTOR review". ComputerandVideoGames. Retrieved April 10, 2009. ^ Fox, Fennec. "GamePro KOTOR review". Gamepro. Archived from the original on December 11, 2008. Retrieved April 10, 2009. ^ Hodapp, Eli (June 3, 2013). "'Star Wars: Knights of the Old Republic' for iPad Review – A Must-Play 'Star Wars' RPG". TouchArcade. Retrieved June 10, 2018. ^ "Archive: Best Game". Game Developer Choice Awards. Retrieved October 21, 2010. ^ a b c "Critical Acclaim". BioWare. Archived from the original on January 1, 2007. Retrieved March 30, 2007. ^ Staff (March 2004). "Best of 2003; The 13th Annual Awards". Computer Games Magazine (160): 58–62. ^ "Top 100 Games of All Time". IGN. Retrieved March 6, 2008. ^ "Best Games and Movies of 2000 - 2009". IGN. Retrieved May 22, 2011. ^ "ScrewAttack Video Game, Top 10 OMGWTF Moments | Game Trailers & Videos". ScrewAttack's Top 10. GameTrailers.com. July 11, 2008. Retrieved January 20, 2010. ^ "Xbox.com Platinum Hits: Adventure/Role-Playing Games(RPGs)". Archived from the original on October 27, 2007. Retrieved October 26, 2007. ^ Day, Patrick Kevin; Boucher, Geoff. "Star Wars' expanded universe". Los Angeles Times. Retrieved May 7, 2008. ^ Lussier, Germain (April 17, 2019). "Knights of the Old Republic Being Looked at by Lucasfilm". Gizmodo. Retrieved April 17, 2019. Kane, Alex (2019). Star Wars: Knights of the Old Republic. Boss Fight Books. ISBN 978-1-940535-21-0. This page is based on the Wikipedia article Star Wars: Knights of the Old Republic; it is used under the Creative Commons Attribution-ShareAlike 3.0 Unported License (CC-BY-SA). You may redistribute it, verbatim or modified, providing that you comply with the terms of the CC-BY-SA.